The Cape West Coast stretches from Cape Town as far as the border with the Northern Cape at Touws River, including within its parameters the indescribably beautiful Cederberg Mountains, famous for centuries-old rock art. All along this stretch of coastline is a series of quaint historic towns and fishing villages with names like Lambert’s Bay, Paternoster, Saldanha and Langebaan that today roll with ease off the tongue, but until fairly recently were left to languor in relative obscurity. Tour of Ancient times. Take a step back into the past. Visit the San Village (Indegeounous Tribe of South Africa). This tour takes you back into time when this tribe roamed the land of South Africa and has since been driven away. 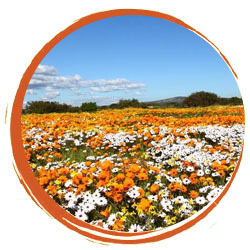 Visit the Fossil Park in Langebaan. Visit the West Coast National park, a Birding Paradise which has Flora and Fauna which is at its best during spring (September to December). A visit to the West Coast in the spring months is the highlight of our Flower season.